The Kennedy assassination is the literary gift that keeps on giving. Authors like Don Delillo, James Ellroy, Norman Mailer, Tim Baker and Stephen King just to name a few have used the assassination as the jumping off point to tell bigger stories. Lou Berney goes the other way. In November Road, the Kennedy assassination and its aftermath is used to tell an intimate tale of love and loss, with plenty of blood and violence along the way. Frank Guidry is a hood with not a huge serving of morals. Based in New Orleans, he works for the Marcello crime organisation. When November Road opens he is selling out his friends and sleeping with a string of women. Then the Kennedy assassination happens and it turns out that he may have tangentially been involved, having a few days before organised for a car to be waiting at a particular spot in Dallas. This was the getaway car for the actual shooter and before long Guidry has been given the job to make that car disappear. Only he quickly realises that, as a loose end, once this is done he too will be made to disappear. While he does not know it precisely, on his tail is amoral hitman Barone, murdering his way across Texas. At the same time, Oklahoma housewife Charlotte with two young daughters, feels like her life is slipping away. Her husband is drinking away their savings and her dreams have long before been crushed. One night she snaps, takes the children and drives away, looking for a better life for her and for them. Guidry (calling himself Frank Wainwright), runs into them and quickly realises that Charlotte and her children are the perfect cover for his own escape. Despite all of the lies, Guidry’s relationship with Charlotte and her daughters grows. Neither, it turns out, is who they thought they were and both change as a result. 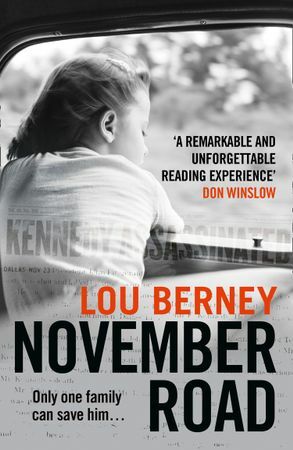 There is plenty to love here – Berney delivers a natural period feel, from the diners to the crappy motels to the Las Vegas strip in the 1960s, all of the characters, including the minor characters, pop from the page and the plot rattles along, building a head of tension as it heads to a conclusion that perhaps should be expected but also comes as a total surprise. November Road is a historical, road trip crime novel with heart. It is a rare find and a welcome one.